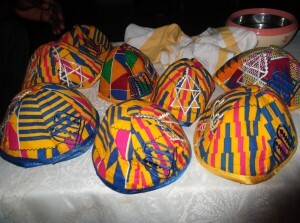 Home » Spirituality » The Jewish Community of Ghana: A Lost Tribe? 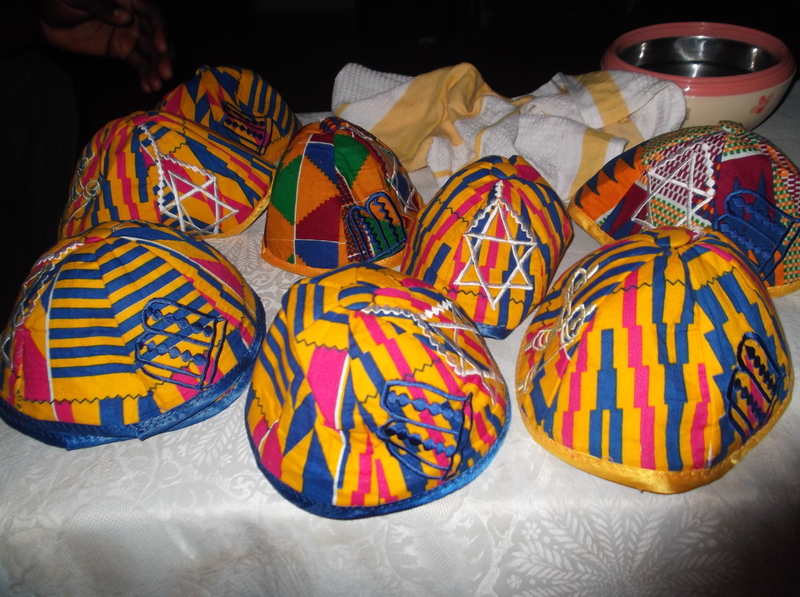 The Jewish Community of Ghana: A Lost Tribe? Best clothes are put on and worn by all. Children are playing in the synagogue. Prayer books are lovingly opened. Songs praising G-d are being sung. The prayer ‘Kiddush’ is recited over wine. This is a familiar scene in every Jewish community all over the world. There is one place however, where this weekly scene is set in an unobtrusive blue and white painted synagogue hidden amongst the cocoa plantations and sugar cane farms of Western Ghana. In the heart of Africa, in a small remote village called New Adiembra in a town called Sefwi Wiawso is an isolated community of Jews. The nearest city is a three-hour drive by tro-tro, a van which can fit 22 people, babies on laps, and live chickens under the seats, on a journey where passengers can feel every pothole in the dirt roads. I travelled to Sefwi Wiawso with a friend to visit the African Jewish community I’d heard so much about. As my work for UK-based charity Tzedek is mainly in Tamale, Northern Ghana, it was an adventure in itself trying to get to the Jews! First came a six-hour journey to Kumasi, and then the three-hour tro-tro ride to Sefwi Wiawso. Unfortunately, due to being given an ‘old bus’ for the journey from Tamale, which of course broke down halfway through, a trip that should have taken six hours took eleven and a half. And due to the phenomenon of ‘Ghana time’ by which everything and everyone is late, the tro-tro from Kumasi to Sefwi Wiawso took four hours to fill up with passengers before it could leave and an extra hour of traveling through the traffic of Ghana’s second biggest city, Kumasi. Total length of traveling: nineteen and a half hours. Finally, we reached our destination. We had been told by Mr Joseph Armah, the Assembly-man to take a taxi to his house. He had assured us that all the taxi drivers know where he lives. Mr Armah is the equivalent of local MP for four villages, a well-respected man who is fortunate enough to own a large compound, renting out three rooms to local Muslim and Christian families. We would be staying the weekend in his guest room. 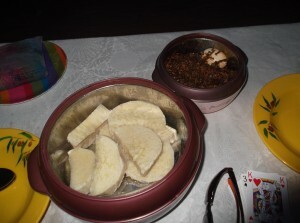 As the sun set over the mountains and rainforests of West Ghana, Mr Armah and his 12-year-old daughter Rachel (Ghanaian name Afua, as she was born on a Friday) stood together to light the Sabbath candles and sing the Sabbath blessing over the wine and bread, before joining us in a Friday night meal of boiled yams and kontomire stew – a mixture of tomatoes, onions, eggs and coco yam leaves (they taste a bit like spinach). After an early night, we were woken by Rachel at 8am ready to be taken to the synagogue. Walking through the village, we were joined by adults and children dressed in their best clothes, a mixture of Ghanaian brightly coloured cloth and Western style dresses for the young girls. Rachel pointed out every Jewish house and informed us that there were three other Jewish children in her class at school and the Christian teachers had started to understand that the Jewish children sometimes had to miss classes due to festivals. The Sabbath service began with a song in Twi, the local language in the Ashanti region. We were told that the song means ‘We thank G-d for all He has done for us’ and that thanking G-d is a nice way to start the Sabbath prayers. Kofi, the leader of the synagogue, led the prayers using prayer books which had been donated by the Tifereth Israel Synagogue of Iowa. The service was mostly in English as the community only know a few words of Hebrew, with a number of captivating Ghanaian melodies thrown in. The weekly Torah (Bible) portion was read out chapter by chapter by two of the congregation members standing at the front of the synagogue, first in English, followed by Twi. Kofi then summarised the Torah portion in both languages so that the children could understand what had been read. After the service, the congregation asked if we would return after lunch to teach them something about Judaism, some Hebrew songs and about the UK. After a meal of cold rice and spicy tomato fish, we returned to the synagogue to play a Ghanaian game called Ampe with some of the children and talk to the community members. We had just as many questions for them as they had for us, and as the adults spoke varying levels of English, Kofi became translator. We learnt that the community only found out about Judaism relatively recently. Their ancestors had always been different from their Christian and Muslim neighbours. They always had their day of rest on Saturday, they slaughtered their own meat in a special way, kept family purity laws as well as circumcising their sons. In the 1970s, a visitor to the village noticed their strange customs and realised that this community may have historical links to one of the ten lost tribes of Israel. Their leader at the time travelled to Accra, the capital of Ghana, to find out more about Judaism. He was put in touch with an American organisation ‘Kulanu’ which specialises in educating and linking isolated Jewish communities around the world with communities in America and Europe. Since then, the Jews of Sefwi Wiawso have grown in strength and number. Unlike my Jewish community in London, these African Jews are not mostly doctors and lawyers, they are farmers. They produce about five bags of cocoa beans a year to sell at 200 Cedis a bag (£75) and walk four kilometres to sugar cane plantations where they earn 15 Cedis a day (£5.50). The children mostly leave school at 16 after Junior High School to help their parents with work on the farms. These Jews are proud of who they are. They are teaching their children to stand up and be counted as part of the wider Jewish community. It has not always been easy for them to be different from their neighbours, especially in a country where Judaism is almost unheard of. Walking through the village on Saturday, I noted that my Jewish hosts greeted not only their Jewish friends, but also their Christian and Muslim neighbours as we passed by. Although they have diverse traditions and practise an unusual religion, this community has managed to combine faith and culture in a unique way, promoting values of tolerance and acceptance of others. Indeed, in Sefwi Wiawso every resident is first a Ghanaian citizen – passionate about their country and opinionated about local politics – and then a person of faith. I left the Western region of Ghana inspired by this community’s commitment to its faith. Each member of the community is completely dedicated to their particular way of life and passionate to learn more about Judaism. Not only are they devoted to practising their faith, they are tolerant and understanding of others. As we left Mr Armah’s compound on Sunday morning, the Christian family next door greeted us on their way to Church and the Muslim and Jewish children living in the compound waved to us as they pounded yams in the yard together to make the local dish ‘fufu’. 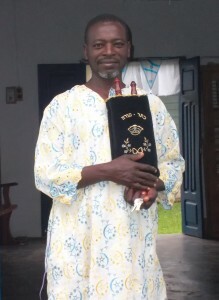 If you ever find yourself in Ghana, be sure to visit the Jews of Sefwi Wiawso. The community is warm and welcoming, and is always pleased to receive visitors! Hannah is a graduate of King's College London. She currently works for Tzedek, a Jewish international development charity which focuses on raising awareness on cases of extreme poverty. She has interned at the Three Faiths Forum and continues to volunteer for them as a speaker on Judaism.